This last day at Dries Verhoeven’s art installation “Ceci n’est pas..” at Gammel Torv the shutters go up in the morning. It doesn’t reveal a living person this time, but living maggots or mealworms in the glass box. An urn with decorations is placed on top of the pile of worms. It turns slowly and its metallic surface reflects the sun. The same classical music as the first day flows out of the glass box and surrounds the audience as they crowd around box. The pile of worms reach up to the head, which allow you to see the surface of the overwhelming amount of worms wriggle, if you stretch a bit. Three Danish women arrive at the glass box: “What are they eating?”, one of them is asking. 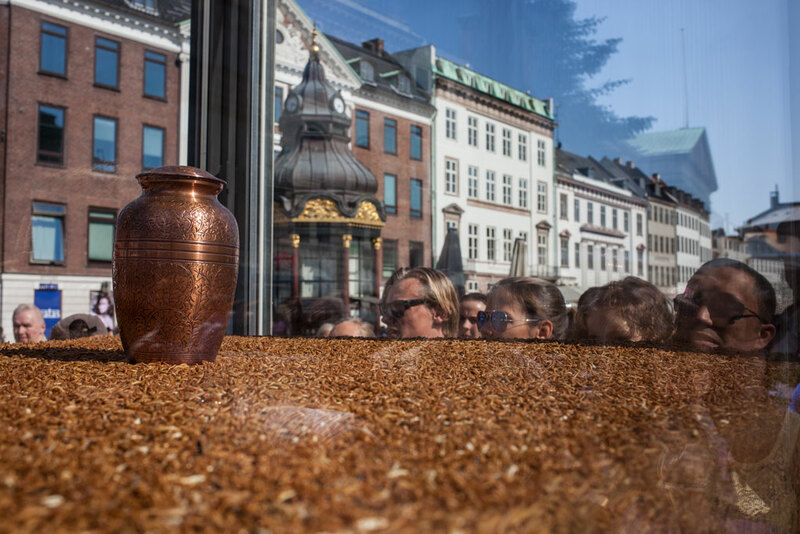 “They eat the dead bodies – it is an urn standing on top of them”. A sound of chewing or slippery worms from the box supports that idea. Some young Danish girls pass the box: “Oh, what is that!?”. “It is maggots.. and it has something to do with how we place the dead outside of the city”, one of them says. “But what is about more generally?”, the other girl asks. “It is about taboos”. Some people in the audience seem fascinated by the sight, while others are disgusted: ”Ugh, gross!”. They cannot stand the sight of it and leave quickly. Two girls, who stay, read the text and comment on the image: ”Yes it is worms, but it is also a person sort of.” The young people do not connect the image of death to themselves as the title suggests: “This is not me”. Probably not that surprising the seniors find this image less frightening than the younger people in the crowd. They know that death is inevitably. When shutters go down this evening, today’s person is already laid to rest and the urn on top of the worms will be the last image that sticks to our retina. This last image of death is also the epilogue that closes Dries Verhoeven’s ten living images of society’s taboos. The last scenes the previous days end with the person inside the box is lying still with his or her eyes wide open. Thus we are everyday asked whether we prefer to shut our eyes for these taboos or do we dare to look our fears in the face? Do we dare to face the imperfection of the different aspects in our society and life? And how do the commercial pictures in public space affect our collective perception and ideals? Many people have returned to the Dries Verhoeven’s installation during the last ten days to be confronted with those kinds of questions through his images. But what is the biggest taboo in Denmark right now, according to the reception of the audience? The image of a Muslim man praying in a bulletproof vest at day 8 caused the strongest reactions and most discussion among the audience. The man was sitting in a blue tunic and a black bulletproof vest on his carpet with at string of beads in his hand. A loud speaker was hanging down from the ceiling. First he looked concentrated counting the beads, then he looked strait into the eyes of the audience with a calm, mild look but maybe also a sad look. The sound of the muezzin’s call streamed out of the box and was heard from a distance. The man in the box got up on his feet then down to his knees with his forehead to the floor. This image made some people angry to see their religion exposed in this way, while others were touched to tears. Some other people did simply not want look at the box that day. Was it their fear exposed right there in the middle of Strøget? This image in particular made the different parts of Danish society discuss with each other. Historically, cemeteries in Denmark were located outside urban areas. According to roman convictions, the dead presented a threat to order within the sacred city limits. The dead were believed to pollute and create chaos. Death nowadays is an even less public matter. Fewer elderly die in their own or their family’s home. Widows and widowers are not recognizable as such. The public display of loss and sadness is considered out of place, as are any signs of decay, degradation or destruction. Historisk set placerede man i Danmark kirkegårdene uden for bymæssige områder. Ifølge romersk overbevisning repræsenterede de døde en trussel mod orden inden for de hellige bygrænser. De døde mentes at forurene og skabe kaos. Døden er i dag i endnu mindre grad et offentligt anliggende. Færre ældre dør i deres egne eller deres familiers hjem. Enker og enkemænd er ikke genkendelige som sådan. Offentlig visning af tab og sorg betragtes som upassende akkurat som tegn på forfald, nedbrydning og ødelæggelse.